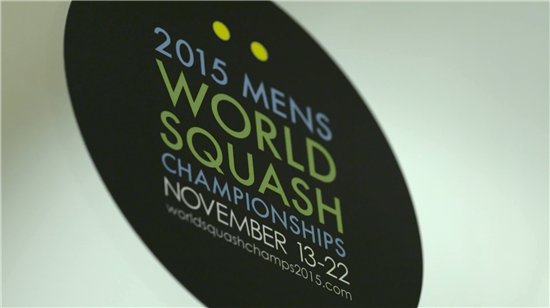 The 2015 Men’s World Squash Championship is being held in Bellevue, WA until Sunday, November 22nd. Held in a different location each year, this tournament is one of the most prestigious squash events in the Professional Squash Association (PSA) World Series and sees the world’s top 50 squash players go head-to-head for the grand-prize of $325,000. 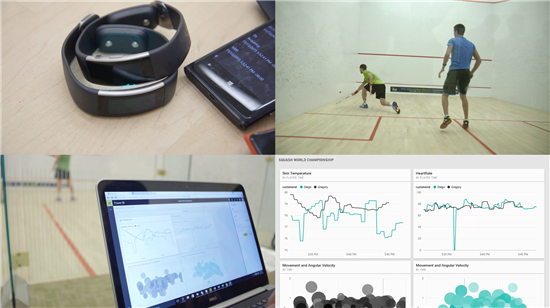 Here at the Microsoft Power BI team we couldn’t resist the temptation to bring squash data to life. Microsoft Power BI is a cloud-based business analytics service that enables anyone to visualize and analyze data with greater speed, efficiency, and understanding. It connects users to a broad range of live data through easy-to-use dashboards, provides interactive reports, and delivers compelling visualizations. 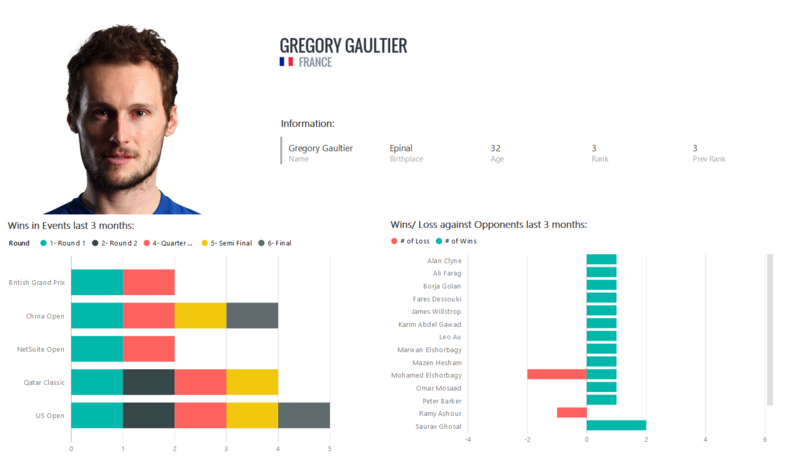 Using Power BI’s data visualization, real time and live connectivity capabilities, we decided to build 2 dashboards with player data to help fans, coaches and players themselves to get more insights out of this event and make their experience even better. The day before the tournament starts, players have the option of having practice games against each other. We asked 2 players, Gregory Gaultier (3) and Diego Elias (40) to wear Microsoft Bands during a practice game to measure their vitals, send the data through mobile phones to Azure Stream Analytics and visualize the output in real time on a Power BI dashboard. Later, we showed them and their coaches the results. We asked them to explore the possibilities of seeing real time player performance and, potentially, take action on it to improve their results. The following video shows the outcome of this experience. The ability to display real time data through the Power BI REST API is unique to the Power BI service and fully integrated with Azure Stream Analytics. This functionality opens endless possibilities not only for sports but for businesses as well. With Power BI is also possible to have live connectivity to multiple data sources, including web pages. Using public information made available by PSA, the Power BI team built a top seeded players dashboard to share with fans at the event and let them explore data such as past results in other tournaments, win/loss record versus other players, current and previous rank, highest world ranking, country of origin, birthplace and more. 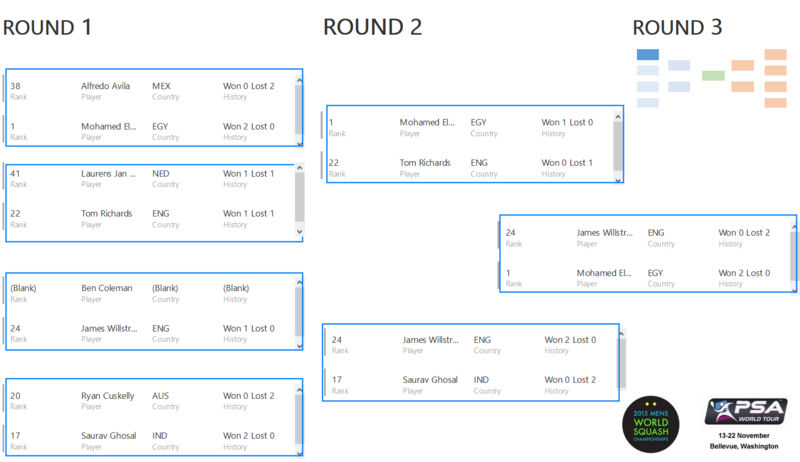 This dashboard also includes a live bracket visualization for fans to follow results and matchings as the tournament develops, including past results for previous encounters between the same players in each bracket. Finally, each top ten player has a detailed report of their performance in previous tournaments over the last 3 months and their win/loss record against other players over the same period of time. 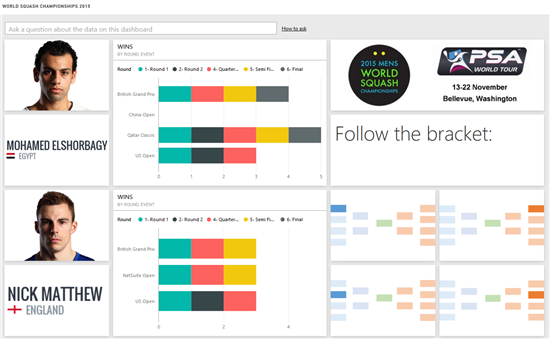 Squash fan or not, let us know what you think about these dashboards and remember that we are not the only ones excited about the World Championship. 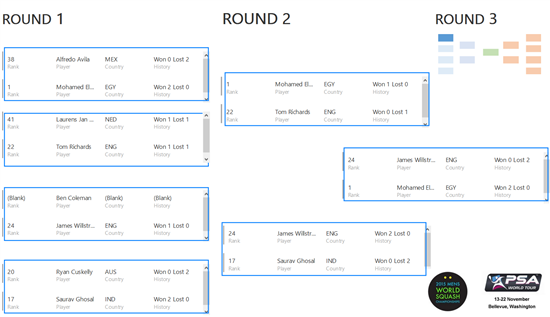 The Skype team will hold a group chat is inviting squash fans around the world to take part of this event through chats with the top seeds of the tournament, Mohamed El Shorbagy, Greg Gaultier and Miguel Angel Rodriguez.